Farming is a unique industry. Even though less than 1% of Americans are doing it, it is still an industry with hundreds of thousands of independent decision makers. It is also a far more dynamic and adaptable industry than one might imagine. A look at USDA crop statistics before and after 1996 demonstrates this point extremely well. 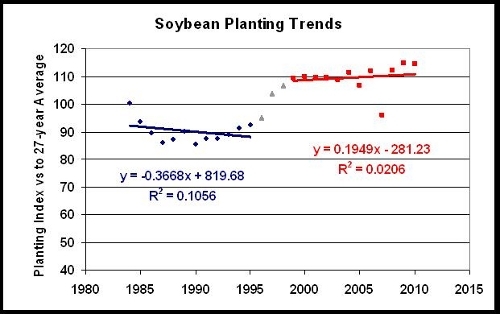 If you look at historical planting data for soybeans in the US, the trends change dramatically after 1996 (see chart above). That makes sense because “Roundup Ready” herbicide tolerant soybeans were commercialized that year. 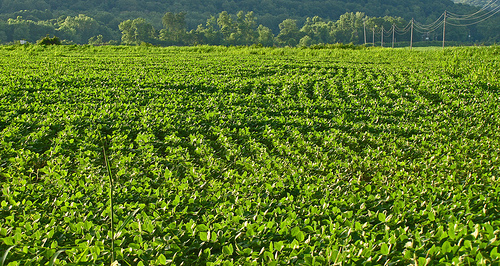 Since 1999, the vast majority of soybean acres have been planted to this GMO trait and there are now about 20% more of them. These soybeans are very attractive to farmers because weed control is much easier and doesn’t involve the sort of plant injury that came with previous “selective herbicide” options. It makes it easier to farm “no-till” which conserves water and uses less fuel. 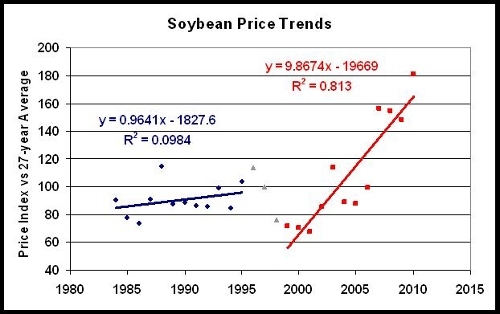 But it wasn’t just soy planting that changed in 1996. Corn also became a GMO crop in 1996 with the launch of “Bt-Corn” which is resistant to the European Corn Borer, a serious pest in the Western Corn Belt. Farmers started planting more corn, particularly after 2003 , but the area gain was not as significant as with Soybeans. 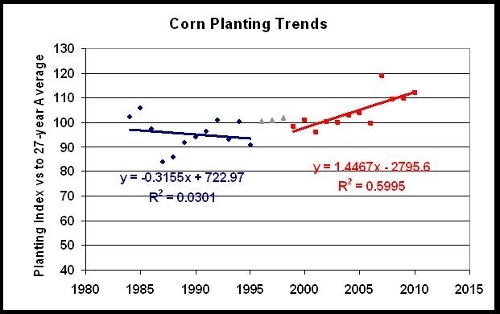 Glyphosate tolerant corn was added in 1998 and improved in 2003. But it wasn’t just the commercial GMO crops that saw a change. Spring wheat (used for high quality bread flour, pizzas etc) saw a dramatic loss of planting area, dropping a full 20% between 1995 and 1999. Much of this was switched to soybeans and later to corn. The spring wheat area has continued to decline and is now 40% below it’s peak. That might not have happened to this degree if two biotech traits were commercialized early in this century. Monsanto was developing a glyphosate herbicide tolerant wheat and Syngenta was developing wheat resistant to a disease call “Fusarium head blight.” These would certainly have helped keep spring wheat more attractive as an option for growers. But nervous customers in Europe and Japan put pressure on the North American wheat industry – threatening not to buy any North American wheat if any GMO wheat was commercialized. The wheat industry gave in and asked Monsanto and Syngenta to shelve their biotech wheat programs – something they now deeply regret. The wheat growers of the US, Canada and Australia have since agreed that they will do a simultaneous launch of any future biotech wheat so that the Europeans and Japanese cannot strong-arm them again. But any such advance has been delayed by 10 to 15 years. The GMO-pact countries are the producers of most of the wheat that goes to countries that can’t produce enough for their own needs (which includes Europe and Japan, but also the Middle East and many other areas rich and poor). Considering how global wheat production is failing to increase as rapidly as global demand, the “Precaution” leveraged by rich Europeans and Japanese has insured that this “Staff of Life” will become very expensive for the world’s poor. 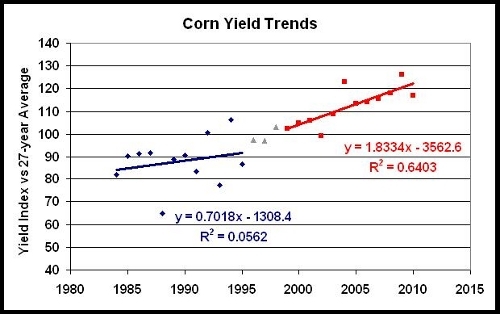 Since the introduction of biotechnology, the rate of yield gain for corn has increased by a factor greater than two. Some of this is from the traits themselves, but it also involves the more sophisticated seed treatments that are now applied to the very valuable seed and the increased investment in breeding (e.g. Marker Assisted Breeding). In years like this with high commodity prices (e.g. as in 2007/8) farmers will also apply fungicide and/or insecticide sprays that are now easy to “pencil” adding several more bushels to their yield. Opponents of GMO crops mistakenly linked the increased chemical use in 2007/8 to biotechnology when it was simply a function of economics. 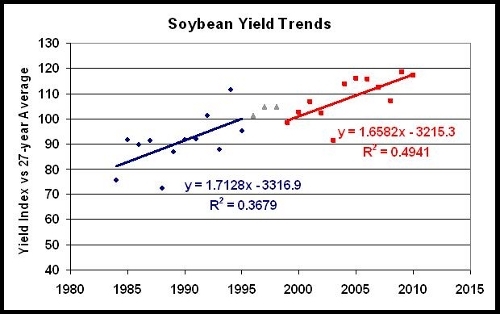 The soybean yield trend shows a “lag” after the introduction of biotech and then a similar but slightly slower rate of gain. This is mostly because of the expansion to areas that were not traditionally major soy producing sites and the lower yields of those regions due to colder temperatures (Northern expansion in Minnesota and North Dakota) and lower rainfall (Expansion to the West). Spring wheat yields are always highly variable because it is mostly planted in more marginal land, but there has been a distinct acceleration of yield gain for this “orphan crop” that didn’t get to be improved by biotechnology. What has happened is the farmers have “intensified” their production of the spring wheat that is still grown. This involves using “certified seed” grown specifically for that purpose rather than just “saved seed” out of their last grain harvest. It involves a “split application” of fertilizer, better seed treatments and possibly a fungicide spray. This represents a greater financial risk for the farmer, but also a greater reward when things go well. These are the kind of adjustments that farmers can make which provide encouragement that the looming global food crisis can be at least partially ameliorated. So, by any measure 1996 was a watershed year for US agriculture. Agriculture is a remarkably dynamic and adaptive industry based on the independent decisions of thousands of individual family business owners who grow our food. The notion that this vast network is “controlled” by any business or government is absurd. Graphs based on USDA, National Agricultural Statistics Service data. You are invited to comment here or to write me at savage.sd@gmail.com. I would be happy to email a copy of these and other slides or you can download them from SCRIBD. My Website is Applied Mythology. Prefer organic food for your little ones? Check out our current selection of organic baby food from Earth’s Best, Baby’s Only, and Happy Bellies. Knowing that you come at these issues from “How do we feed 6-9 billion people sustainably?” has definitely forced me to think about my own assumptions regarding agriculture and food production… I appreciate that. Still struggling with the GMO issue, though… I get it at many levels, though still wonder about potential impacts of their introduction into the broader ecosystem (because genetic material doesn’t respect property boundaries… this also ties into some of the intellectual property issues that have arisen), and, of course, the human health issue. I’m sure you already know about the data review recently released on organ disruption in animals and GMOs. I looked over the introductory section of the study, and see that the main conclusion the authors present is, essentially, more study is needed (with longer time frames). I’m interested in seeing your response to this (maybe that’s another post as opposed to a comment response). I don’t know enough either way to make any bold pronouncements… I would be interested in your thoughts, though. This is definitely about how do we feed the global population and what we see with wheat (denied the benefits of biotech but still innovating by other means) is very encouraging. If the organ disruption thing you are talking about is what I think it is, it is a classic example of “junk science” and/or “agenda science.” Can you send me a link to what you mean? I think I blogged about this a while back. We have already had one Green Revolution to stave off worldwide famine, which resulted in dependence on petro-based chemicals and led to the megalithic power of ag corporations…as well as GMOs. That really concerns me, whatever benefits might have been gained. I would much rather find ways to make local populations self-sustaining and give them the resources, and knowledge, to produce the right amounts of food for their area through methods that are appropriate for their area. If we continue to have developed (Western) countries developing all technologies and producing most of the food, that will only continue an aid-culture and leave people helpless on their own. There are a lot of good efforts underway to make region and scale-appropriate advances for food production in the developing world. Governments have pretty much abandoned those investments but fortunately groups like Gates are filling the gap. I just spoke with a colleague who spent two years in India helping an Indian owned company (grandson of a Ghandi inner circle figure). They run an integrated bio-refinery and have >15,000 small local farmers who supply sugar cane all coordinated via cell phone. The farmers then plant corn and other food crops during the rattoon. The company offers small cap loans for fertilizers etc and they are teaching the farmers to build the organic matter in their soils. They definitely use some modern technology but in a very small scale way. They supply all their own energy and sell various high value fermentation co-streams to bring wealth into the community. Appropriate ag in the developing world does not need to be primitive. Thanks, Steve, and of course not. But the question is what aspects of modern “technology” will be used or accepted? If that development assistance comes with a push for chemicals, monocultures, and other typical industrialized methods, then we may just be creating more problems for the world down the road. I saw a film recently that highlighted a gardening/farming initiative in India. The people explained how the chemicals that were originally used only hardened the soil. But when a sustainability-focused organization started to help them and taught them how to use organic compost, they were able to regenerate the soil and avoid using pesticides. People seem to think that no one in agriculture learned anything about how to do things better since the 1960s. In fact tons of things have changed. As for the Organic compost, as I’ve written many times it has a big Carbon Footprint issue because on a commercial scale there are always enough methane emissions from “aerobic” composting to make synthetic nitrogen look great by comparison. Steve, I do not mean to be obtuse, but I really am not seeing much other than how to maximize benefits to humans through agriculture. I am still left asking, How are monocultures, pesticides, GMOs, agribusiness monopolies, factory farms, and animal gene/morphology alteration, to name a few, good for the planet and *other* beings that live upon it? Let me be clear: I am not saying we should sacrifice humans and should do what we can to provide adequate food (and other resources) to everyone, justly. But I feel it incumbent on us to make sustainability as high a priority as production. When one steps back and looks at all the trends in Ag, particularly since the 1980s, they go in the right direction for sustainability. US fertilizer use has not increased even though productivity has increased dramatically. The average toxicity of the pesticides used has dropped with the vast majority falling in the EPA category IV and only 0.2% in California in the category I which most people imagine when they hear the word pesticide. GMO’s have been declared safe by every national and international panel of scientists that have reviewed them. There are no monopolies in ag. There are some consolidated segments like grain trading and seeds, but those are still much less concentrated than something like computer chip manufacturing or grocery retail. The vast majority of US farms are still family farms – its very well documented and I’ve visited scores of them and they are in no way “factory-like.” The World Wildlife Fund agrees that the best way to protect the other biota of the earth is to be extremely productive on the land we farm so we don’t have to convert more natural land to farming. Moving to something like Organic has the opposite effect. I would like to see even more good practices adopted in ag, but the main limitation to that is the short-term income demands of the mostly city dwelling people who own the majority of farmland. The standard structure of farmland leases works against making the optimal investment in building soil quality – something that takes years to pay off fully. So reciting all the demonizing language about farmers accomplishes nothing for the planet. Help me find the greedy, ignorant land owners and convince them to make a long-term investment in their asset. Hmm. Those are interesting points. Maybe it is just my ignorance, or predisposition, but millions of acres devoted solely to corn, soy, wheat, or even almonds, or the muscles flexed by Monsanto and Cargill, or the billions of animals raised in confined enclosures and processed with lax regulation and oversight…there is a lot I still see that disturbs me, whatever the trends might be. Also, I am not trying to demonize farmers. I have great respect for farmers, especially now that I work with and represent them every day via the Farmers Market here. I am just as concerned as you are about supporting them; I just also want to be sure that we are not doing so at the expense of other things. There are real limits to the muscles of Monsanto or Cargill. Cargill is in an extremely low magin business with very real competitors like Bunge and Continental Grain and ADM. These players all have huge leverage vs the farmers, but they are in intense competition with each other. I would never want to be in that business, but its something that has to be done and scale is critical to survival. Monsanto has muscle based on its ownership of the foundation seed companies that develop the new inbreds for hybrid corn etc. They still have significant competition from DuPont (Pioneer) and Syngenta and some small companies. IMHO, it is a fact in recent history that the homologation of a number of new substances used in agriculture has been too quick. As you often point out, many substances allowed in the last 50 years have been banned or are being banned for their impact on animal and human health. Others have become useless due to resistance, which is not, in my understanding, compatible with sustainability. Saying today that ‘this is safe according to scientists’ ignores recent history and ignores the fact that studies conducted to obtain homologation of a substance or GMO are made by the company itself ! Take a deep breath and read again. Studies supporting the homologation of a new substance or seed are conducted by the company that has invested large sums of money in it. Take another deep breath and read the following. Those files are then reviewed by national administrations. In the US and in Europe, it has happened more than once that experts working for those administrations are, have been or will be working for private companies that request homologations from the very same agencies. That is a great guarantee of independency, isn’t it ? Monsanto long claimed that glyphosate was harmless whereas it is now under scrutiny from the EPA after argentinians scientists published a study in which they say it is carcinogenic. At the same time, it is reported that weeds are becoming tolerant or resistant to glyphosate. Bt corn could be another time-bomb. Although Bt is used in conventional and organic agriculture, its use is limited in time (a few applications a year), in quantity and only concerns the aerial part of the plant. In Bt corn, it is present in the roots also and it has been found that the concentration of the ‘Bt gene’ has increased a lot in waterways close to Bt corn fields where it could be harmful to marine life. From a sutainability point-of-view, corn requires a lot of water during summer. Even if it seems undisputable that round-up ready soybean and Bt corn have helped farmers increasing yields, only time will tell if those yields can be maintained in the future and with exactly what environmental impact. Steve, I completely understand–there are very real pressures to produce more food, more quickly, more cheaply, and so in those moments ethics and ideals get pushed to the wall. However, I am going to keep pushing back. We have to take ethical considerations into account, to think about larger sustainability questions and the future generations, instead of myopically focusing on the bottom line right at our toes. – shareholders want ROI as high and as quick as possible. Reflecting upon your comments on the land owners, I come to the conclusion that the same applies to the greedy share owners. 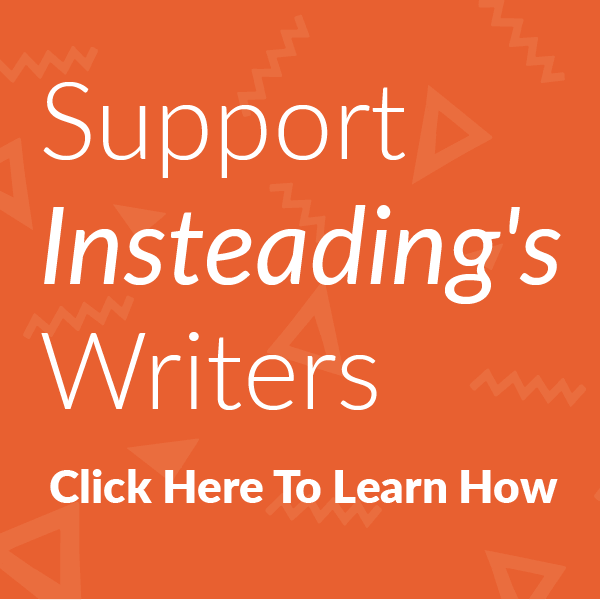 @Marc– Make as many extra points as you feel you need… I’m really enjoying following this discussion. It can cost a company 200 million dollars to do all the research required by regulators to register a new chemical. No government is going to pay for that and the logic is that the company that can benefit from the sales must pay it. If you have some other approach I’d be interested to see what it is. Even though the company pays for the testing there are very detailed rules about how it must be done and how the data is reported. It becomes impossible to hide negative results. Yes, many old pesticides have been banned, almost all being things that came into use before we had agencies like EPA. I can only think of one major new chemical that was banned because of an unexpected environmental issue, fipronil. As for patents, that is necessary to make it worth it for a company to invest all that money to invent new things. Again, there is no other source of money on that scale. Even Universities and government scientific discoveries tend to be patented because that gives companies incentives to license and develop commercial products. The patent system actually spurs further innovation because the rules require that the patent applicant “teach” enough detail so that others can read and understand the novel technology. That in turn tends to give people ideas for other novel inventions. People like to complain about all these things, but they are part of a well functioning Capitalist system. Unless you want to live in Albania or North Korea that is the way it is going to be. Even China has realized that these things are important. It is fine to do “open source” invention for fast-moving, low expense areas like software. I don’t think you can have industries like agricultural chemicals, seeds or pharmaceuticals without mechanisms to give anyone the incentive to invest hundreds of millions of dollars over 7-10 years before ever selling a product. Without protection no one in their right mind would do it. I may have expressed myself in an unclear way but as you probably know, English is not my mother tongue. Let me try to re-phrase and explain. I criticize the patenting system and the shareholders in the agricultural domain in the same way you blame land owners for not fostering sustainable practices : a 20 year patent and impatient investors are not the adequate incentive. I do appreciate the need for an inventor to see his investment protected from being copied and I do respect private initiative (keep in mind I left the public sector to try and become a farmer). However, they were never designed to guarantee public health and environmental sustainability. This is a new challenge for mankind and we need to think fast how to address that issue. I do not criticize the fact that a company pays for the registration of a substance or seed but the fact that the study is carried-out by the company itself, not by an independant laboratory. And in my experience, those who have to review the files are either not competent enough or not independent enough (ok this is a very, very rough judgment based on my own limited experience). However, we have enough examples of an industry that has falsified reports and a regulatory body that hasn’t done its job (AIDS infected blood in France, nuclear industry in Japan, Mediator medication in France) to realize that the system has flaws. All democratic, capitalist countries. Communism in eastern Europe has probably harmed the environment more than capitalism in the west and even though it could be an interesting experience from a curiosity point-of-view, I do not wish to live in a communist country. Would be complicated too : except North Korea (Albania has joined the NATO in 2009 and though plagued with corruption, it is no longer considered as a communist country), I do not see any other example left. The fact that communism has failed to last longer than liberal capitalism does not prove that the latter is sustainable. It may simply prove that capitalism is more efficient at producing with less resources. Economically more sustainable but not environmentally. It is interesting. For my college application to Stanford in 1973 the essay question was, “If you were to write a book, what would it be about.” I said a comparison of the environmental record of Capitalism and Communism. I think that there are ways that a country like China can just arbitrarily decide to do a good thing (e.g. build huge wind farms) as much as they can decide to do a bad thing (like build coal plants at a frenetic pace). Here in the US we have lawsuits for decades that block the building of the wind farm, but then we had a clean air act that stopped acid rain to the point that farmers are starting to have to apply sulfur. We probably don’t disagree as much as it may seem, but come at the same goal differently. Thanks for participating in the discussion.